Our Second Great War at Sea alternative-history story arc looks at naval campaigns in a world where the First Great War ended in late 1916, allowing the great empires to survive for another generation and clash again in 1940. Sword of the Sea brings the naval action to the Black Sea, the Eastern Mediterranean and the Red Sea as the Ottoman Turkish fleet faces the Imperial Russian Black Sea Fleet along with the Royal Romanian Navy and the British, French and Italian fleets. There are 180 new silky smooth, die-cut playing pieces: 100 of them double-sized “long” pieces depicting major warships and the remaining 80 normal-sized square ones representing small warships, transports, aircraft and some markers needed for play. Ships and aircraft representing the Ottoman Turkish, Imperial Russian, Royal Romanian, Royal Greek, Imperial German and Imperial Bulgarian navies that never existed are all present. 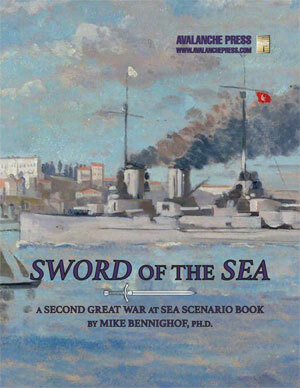 Sword of the Sea includes forty new scenarios organized in our popular “story arc” format, telling the story of this alternative Second Great War in Turkish waters. Sword of the Sea is not a complete game and is not playable by itself; ownership of La Regia Marina, Horn of Africa, The Habsburg Fleet Second Edition and Black Sea Fleets Second Edition is necessary to enjoy all of the scenarios. The Second Great War at Sea is an exercise in world-building never seen in wargame publishing; our Second Great War background book tells the full story of this history that never happened.